Here’s a very tall, perennial plant that is new to me! Look at those balloon-like flowers! They occur in clusters of up to 30 flowers at the top of a single flowering stalk. The 1-inch flowers have 5 white petals, but each petal is split to look like two. The sepals behind the flowers are uniquely fused to form a “bladder”. The bladder often has a delicate pink hue, due to presence of tiny reddish veins that are scattered across it. The bluish-green leaves are opposite and hairless; they grow 1-3 inches long and are narrow and lance-shaped. In Spain, and a few other countries, the leaves are collected and eaten in salads or cooked for other dishes. See the gallery below for an image of the leaves. 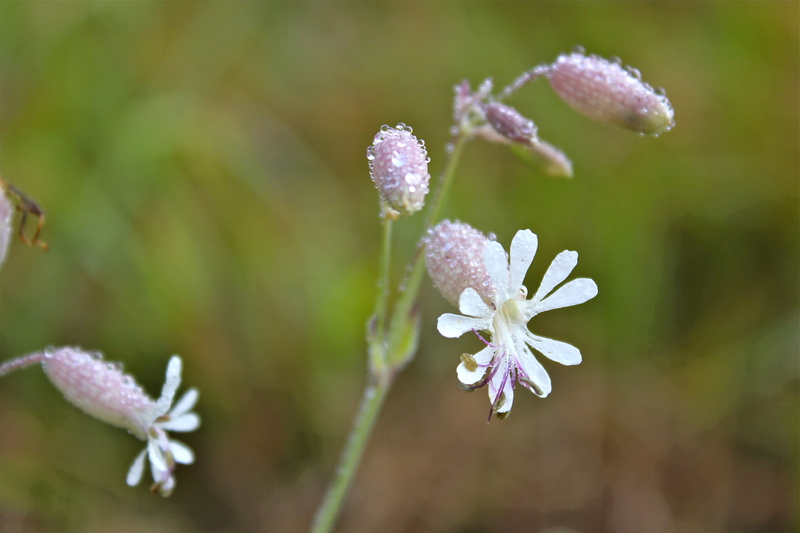 Bladder campion was introduced to the U.S. from Europe. It is now classified as a weed, albeit a fairly dainty-looking one! Bloom time for this plant is April to September.